The total distance is about ~6 miles or 10 km. This self-guided walking tour of London should take about 5 hours to walk along this self-guided walking tour of London with stopping for food, photos, and the obligatory pint without actually going inside any of the attractions, besides the markets. Be sure to wear comfortable shoes! If you’re planning your trip to London, book your accommodation ASAP. Although food in London wasn’t as bad as anticipated, accommodation was very expensive for my short weekend in London. For those who are cringing at the thought of a hostel, friends of mine have loved staying at CitizenM, a boutique hotel with good prices and business-style amenities. Their Tower of London hotel has views of the Tower of London although they also have a hotel in Shoreditch. London has some stunning luxury hotels as well. For London, rates are high, so I recommend booking your London hotel as far in advance as possible as I recently helped a friend find a hotel in London. 99% of hotels were booked up around 1-2 months ahead for her dates. Similarly, I recommend checking the location as some stunning hotel locations that I looked up were cheap, however when you factor in the cost of the London Tube, your hotel might end up being more than you realize and you will need to combat the rush hour crowds. Check accommodation rates in London now! As a New Yorker, I felt that it was very important to compare London bagels with New York bagels. I was very impressed with the bagels at Beigel Bake. I recommend it with salted beef and/or salmon if you eat either. Brick Lane is at the heart of one of London’s coolest neighborhoods. I loved walking down Brick Lane to peek into the vintage shops, stop for a snack, and just take in the great graffiti that I saw along the way. Click to book a full alternative tour of London, including the best graffiti. I loved this market, which has stood in the same place for 350+ years. The existing building dates back to 1887 and it’s full of cute stalls. I ended up stopping off for donuts, a cup of coffee at Department of coffee, a duck taco at the Duck Truck, and the Diner, an American style diner for breakfast part II with unlimited coffee. I also had a blast browsing the little stalls for beautiful clothing and jewelry. For my Harry Potter fans here! 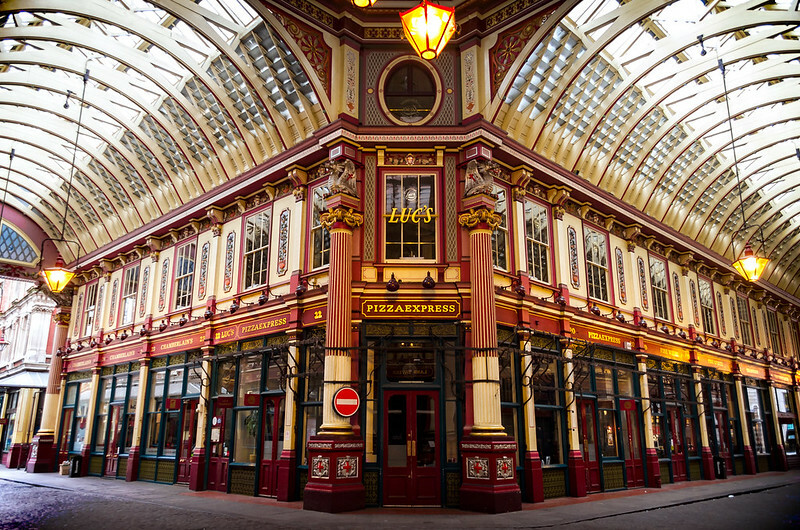 Leadenhall Market stood in for Diagon Alley in the first Harry Potter film. It’s a stunning Victorian covered market and be sure to take a photo by the Bull’s Head Passage, which was the entrance to the Leaky Cauldron. Don’t worry: you don’t need to tap the wall to get inside. The Tower of London is one of the main landmarks of London. The castle dates back to 1066 and it was built during the Norman Invasion. At various points in history, it was used as a prison for political prisoners (including Queens). Notably, Anne Boleyn (of the Tudors) was executed here. Besides the history, the British Crown Jewels are on display here, including a couple pieces worn by the Queen. Can you visit London without seeing the famous bridge? Interestingly enough, London Bridge is actually another bridge and the Tower Bridge is the one that you’ll want to visit. I loved walking across as the Tower Bridge has fantastic views of the Tower of London! Hay’s Galleria used to be the warehouse used for the storage of tea brought into London. It’s just a stunning piece of architecture, so when I visited, I had to step inside. It’s a cool example of mixed used architecture and how a building can be reimagined! Food, finally! Be sure to get here prior to 4pm as many shops close up around then. Borough Market is London’s oldest food market and it has over 100 stalls. You’ll find everything from French cheeses to street food to sandwiches. We recommend avoiding the lunch rush and trying to arrive here around 11am or 1pm (or so) to avoid the crowds. Shakespeare’s original Globe Theatre stood in the vicinity of this modern reconstruction. Even if you don’t attend a Shakespeare play at the theatre, it’s worth admiring it and imagining the London of yore. Any Harry Potter fans here!? I mostly passed by this bridge, featured in the Harry Potter films, just to see it in person. It famously collapsed in “Harry Potter and the Half-Blood Prince”. You don’t need to go over it to take a good photo! Did you know that it’s free to visit most of the Tate besides special exhibitions? Be sure to step into one of London’s best museums for free to check out whatever art that you can enjoy during your time here. (I didn’t include time in the museum as part of the walking tour.) The views over London are great from up top! For iconic views of London, consider going up in the London Eye. Personally, I was happy with the views from below, but I’ve seen some amazing shots taken from inside! Before you cross the bridge to visit Big Ben, be sure to walk along the Thames and go down the stairs. You’ll see an archway, which has one of the most iconic views of London with Big Ben & Westminster Abbey perfectly positioned and a comfortable ledge to pose by. Any lover of V for Vendetta must see Big Ben and the Houses of Parliament in person… I didn’t end up going inside as the lines were quite sizable, however it’s still worth admiring Big Ben up close! Inside the abbey museum, you can view the coronation chair, pay your respects to some of Britain’s most famous people, and admire the historic cloisters. At minimum, admire the exterior of this historic church and abbey, even if you don’t pay for entry. If you hope to see the changing of the guards outside of Buckingham Palace, be sure to get there early (10:15am) and/or consider reversing this walking route. The ceremony starts at 11am and it’s worth seeing, so be sure to try to make it for the ceremony. That said, Buckingham Palace is still worth admiring! Click to download your printable PDF of your London walking tour!